Me: "Are you heading to The Clink too?" 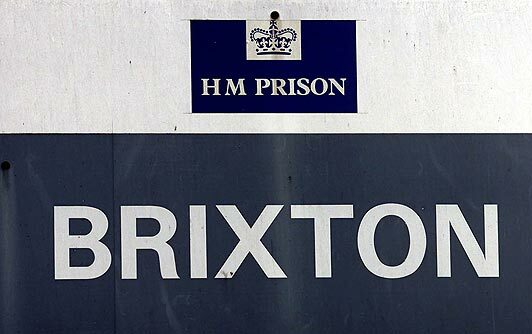 As it turned out, they were en route to The Clink restaurant in Brixton, the third of its type after HMP Highdown opened in 2009. The Clink Charity is a fantastic initiative that employs prisoners in various roles, doing 40 hr weeks working towards NVQ qualifications. Organic produce from Bromley gardens is maintained & harvested by prisoners training in horticulture, others work in industrial cleaning & recycling, and several are trained as chefs and waiters by Chef Alberto Crisci. After that slightly terrifying chat, it was all very pleasant. 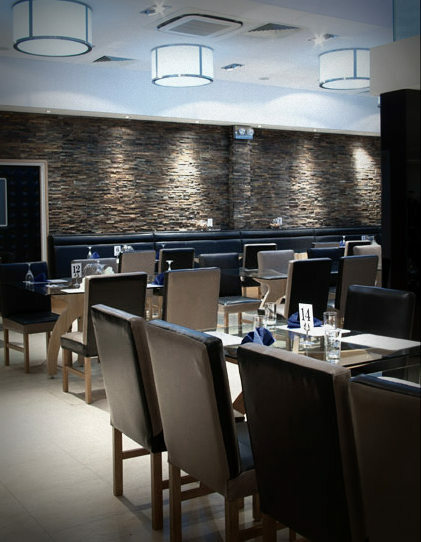 Chris and I were shown to a table in the reasonably attractive dining room within the prison walls, and we mulled over our lunch options, just as we would anywhere else. The only giveaways were the plastic cutlery and name tags on waiters' uniforms. Once everyone had settled up, our group gathered once more to be taken back outside. There was time for one more scare as they accidentally shut the main gate with two customers still inside - I wonder if they do that every time for a laugh? Passports were recovered, iPhones were switched on, gum was chewed and we all went on our way after a slightly surreal but enjoyable lunch - definitely worth a try! 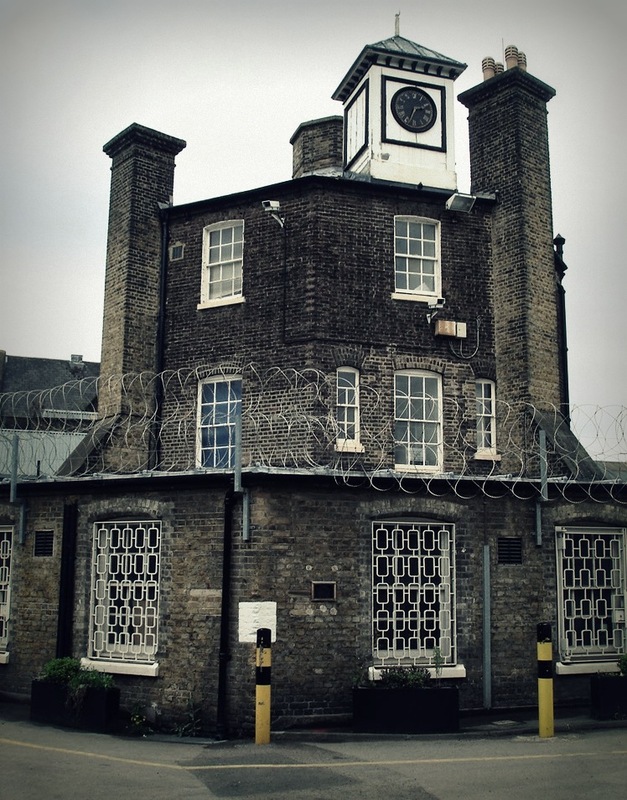 Matt The Fact: HMP Brixton is also home to Gordon Ramsay's Bad Boys' Bakery which he launched in 2012 - a similar social initiative with the aim of reducing reoffending rates by training bakers on the inside, and helping them find work on their release from prison. They have a strong connection with Caffé Nero, but you may also have seen some of their products at Brixton Market or Lower Marsh Market or in Ben's Canteen, Brixton Cornercopia, Daily Goods Coffee, ROAST amongst other places. And just down the road in Brixton Village, The Joint is so-called due to their connection with the Bad Boys' Bakery. 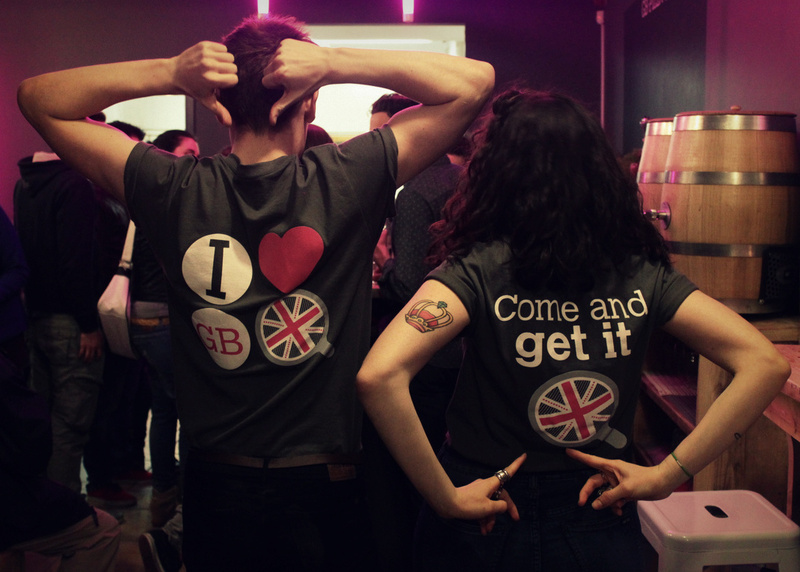 Friday 11th April - Now for something completely different, GB Pizza Co set up shop on Exmouth Market opposite the new Bonnie Gull after making quite a name for themselves in Margate, and I went along to the launch night, 3 months ago...! Rachel & Lisa have set up a funky little site in London, with their trademark pink neon, vintage furniture, and traditional signwriting and artwork by street artist Teddy Baden. The loos also boast a collection of work by the renowned fashion photographer Mark C O’Flaherty. The enormous depiction of Garbo the great dane made more sense when two of them rocked up at the party late doors. Before we get to the pizzas, I must mention the booze. 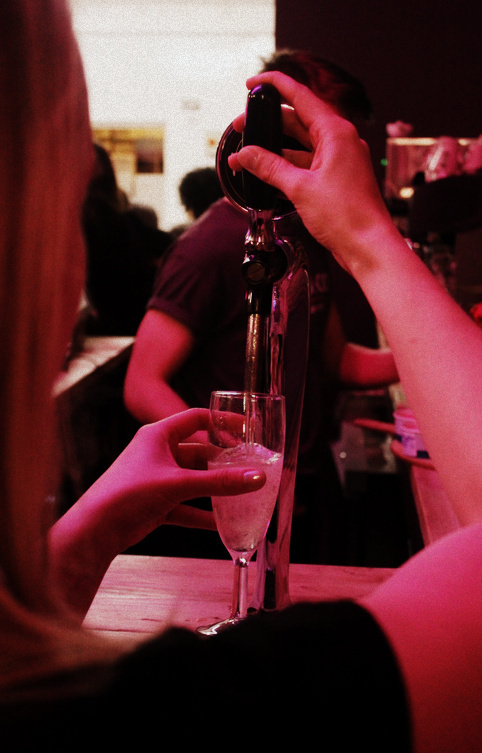 They have prosecco on tap and organic wine in barrels, but you are left to pour them for yourself! No doubt, this is easy to regulate on a normal evening, but it was carnage (in a good way) at the first night! Now, the pizzas. Order at the counter, wait (a wonderfully short amount of time) for it to arrive, pick it up, fold it, ruin your [insert clothing choice], and eat it. There are no plates for your Margate-rita. Max's jeans lasted about 3 minutes. We sat in the optimum position close to the prosecco and bang in the middle of a steady stream of staff carrying freshly made pizzas. Gaba & Lewis deserve special praise for their heroic efforts all evening. We devoured countless slices of tasty, thin-crust pizzas (very different style to Franco Manca, Pizza Pilgrims & Homeslice) with a variety of delicious toppings. Think Fennel Salami, Pear & English Blue Cheese, Air Dried Ham & Rocket, Peppers & Goat's Curd, Lamb & Mint Pesto. Don't skip the garlic bread either. The prices are so low across the board that you might just find yourself ordering a second pizza. If you have any room left, get yourself a tub of Gelupo Gelato (Soho's finest - salted caramel / hazelnut is my preference) with a Climpson & Sons coffee on the side. GB Pizza Co is a lovely addition to Exmouth Market, and refreshingly cheap for the area! Thumbs up. Thursday 10th April - Last but not least, a behind the scenes look at Compass Box Whisky Co. with Chris Maybin at their site in Chiswick. Chris welcomed me in to their whisky lab with an Unholy Alliance, a superb twist on a negroni made with their Spice Tree. This is where the blending magic takes place, in a large kitchen / tasting room a few metres from their desks. 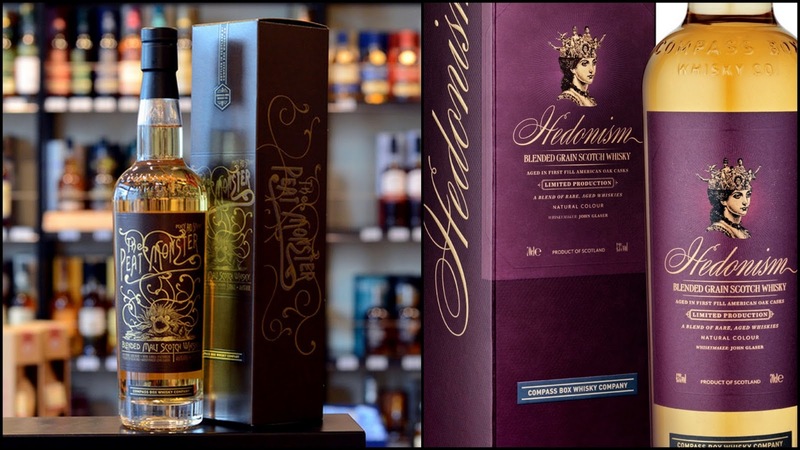 Compass Box have set out to challenge the widely held belief that a blended Scotch whisky can't stand up to a single malt. 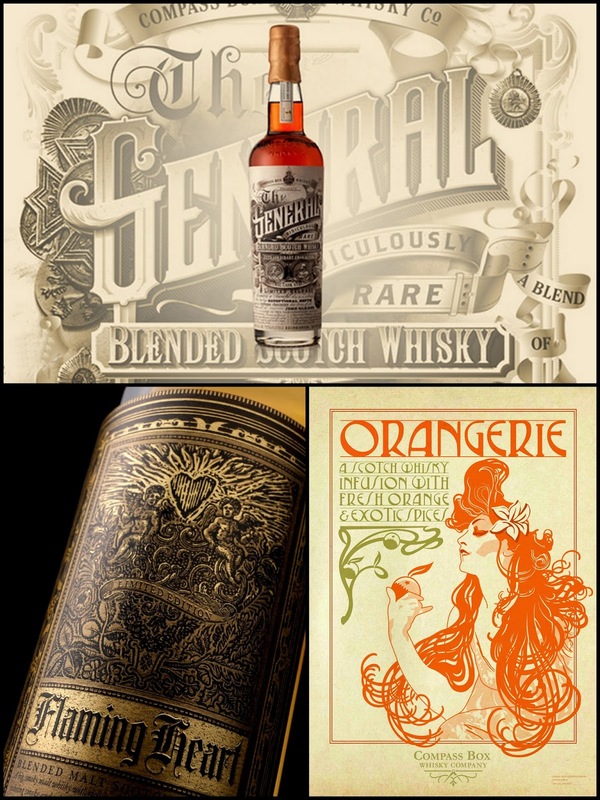 They have also put together a varied core range to give us all several excuses to drink whisky. Mid-afternoon? Pre-dinner? Nightcap? Compass Box has you covered. Before we got to taste testing, we looked around the lab / kitchen space where work akin to perfume making takes place. 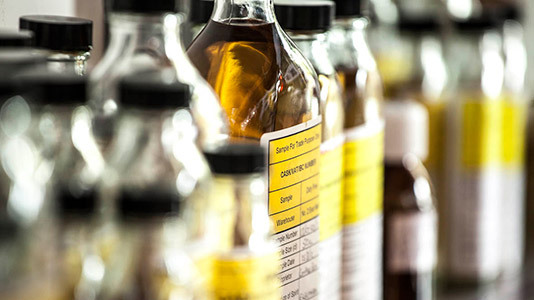 Various experiments & samples fill the shelves including Strathclyde in irn bru casks, and attempts to recreate the now discontinued Eleuthura blend. 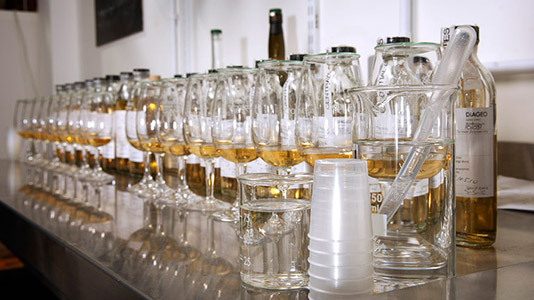 They are also starting to lay down their own whisky, a big project that is a focus of their 2nd decade of existence, along with their popular Great King Street range. Asyla – 40% - The Pinot Grigio / aperitif whisky - star of Milk & Honey's revered Penicillin twist. Peat Monster – 46% - my bedside whisky - was the most peaty whisky in town when it was first released – now it's actually peatier as they have upped the Laphroaig. Look out for the 10th Anniversary edition. Most companies with this many products lose some quality along the way, but the varied Compass Box range is consistently exciting. It is clear a lot of love and hard work is going in, and the team members I met were an enthusiastic bunch. It's no surprise that they are the house whisky in joints like Peg + Patriot, distillers & mixologists all over London are making use of the superb Compass Box blends. It's brilliant to have them in London, and they can start to feel like experienced old hands as the likes of London Distillery Co. and East London Liquor Co. start work on their own whiskies in the capital. Add some to your whisky collection and don't listen to the single malt snobs!